Welcome to the third of six studies of the Book of Ephesians. Ephesians Chapter 3 reveals to us the mystery that was kept secret since the beginning of time. As if that wasn't enough, we learn about the deepest riches of God's loving grace. Your learning comes from reading and studying the Bible. After you have read chapter three below, it's a good idea to answer the daily study questions. God Bless and enjoy your study! 1. 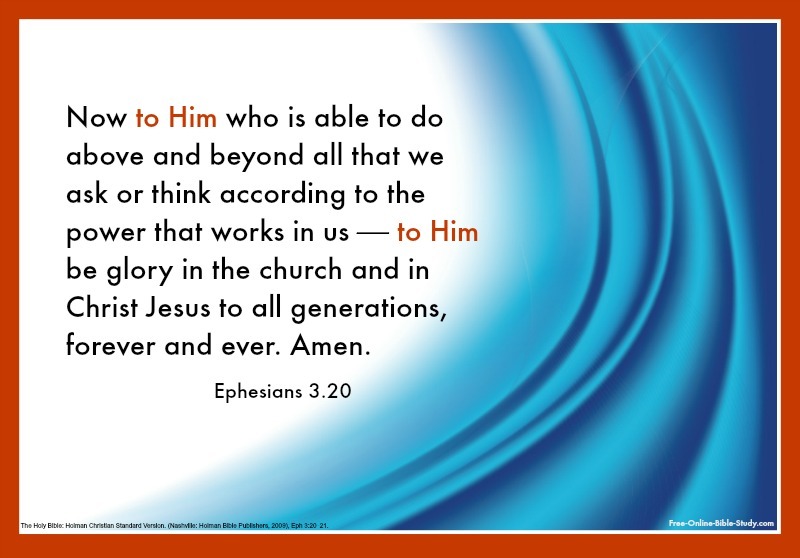 From the following verses in Ephesians Chapter 3, how does Paul describe himself? 2. Who revealed the mystery to Paul, the Apostles and Prophets and the Gentiles as provided here in this third chapter of Ephesians? 3. What are the three aspects of the mystery as seen in verse 6? 1. This chapter starts with the words “For this cause. . .” To what is Paul referring? 2. Paul’s words “For this cause. . .” is followed by a parenthetical phase which starts with the word “if.” Where does the phrase stop? 3. What's the theme or purpose of the parenthetical phrase? 1. Verse 5 states the mystery was hidden and not made known to men in other generations. What was a big hint given to Abraham about the mystery? Cite the verse. 2. Who might be the principalities and powers in heavenly realms from verse 10? 3. Why does it seem interesting or unusual that Paul describes himself as a prisoner of Christ Jesus? 1. Why do you think God kept his plan for the Gentiles hidden? 2. Why would Paul’s suffering “for you” (verse 13) be for the glory of the Ephesian believers? 3. What does this chapter of Ephesians tell you about Paul’s attitude about his responsibility for the gospel of the mystery? 1. What do we learn about Jesus Christ from the following verses? 2. What cause is Paul referring to in verse 14? 3. What 3 things does Paul pray for in verses 14-19? 1. What do the following postures have in common? What did Paul mean to convey by using one of these postures to describe his prayer? 2. Verses 20 and 21 of Chapter Three of Ephesians are some of the most memorable verses in the Bible because they describe God’s abilities while praising him. How do we fit into the equation?